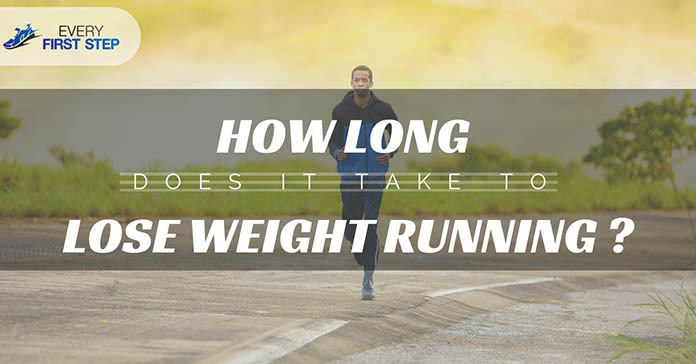 How Long Does It Take To Lose Weight Running ? ​Why You May Not Be Losing Weight ? One of the first things you need to understanding is that the number you see on the scale is not a very accurate measurement of what your body is going through. For example, the moment you drink a gallon of water, you will weigh about 8 pounds more. Another reason the numbers on the scale are far from accurate is because your body tends to store more water when you run. This is because it needs water to help deliver nutrients to your muscles while they are exerted during your run. All this accumulated water adds to your weight. The third reason why you may feel you are not losing weight is because muscle is heavier than fat. As you go through your workout, fat is converted into muscle. When this happens, your body has a higher density of muscle tissue. Aside from believing a number on the weighing scale, there are common mistakes runners make hindering them from losing weight. One of the proven methods of weight loss is cardio exercises. According to research, endurance workouts such as running actually impairs muscle growth. This means that although running is an amazing way to keep active, other cardio exercises are better at weight loss. A common misconception when it comes to weight loss is that you burn a lot of calories from workouts. This is very untrue- simple things such as eating, thinking and even standing also burn calories. The biggest factor that will cause weight loss is intensity. Running longer builds endurance but running faster is what burns calories. Studies show that if you stick to the same routine, not increasing the difficulty level, weight loss is slow. If you keep the same running rate for a long time, the initial effect this has on you will be short lived. After a few weeks of the same exercises, you will find that your body is accustomed to the workout and no longer burns fat. There is a winning formula that will allow you to continue doing the exercise you love but tailoring it in order to avoid the mentioned mistakes and get the best results. Here are some tips to help you tailor your running routine in a way that ensures the most weight loss. As mentioned, keeping the same pace and duration of your run will hinder any noticeable weight loss because your muscles adapt to the workout. To avoid this, mix your workout to include short runs, long runs, speed intervals and different terrain. In addition, try to include strength training and cardio exercises to boost your strength and metabolism. If you are doing a single 45 minute run or staggered shorter runs per week, this is not enough to lose weight. Generally speaking, to lose a pound a week, you will need to reduce calorie intake to 500 calories per day and run for three to four times a week incorporating the routines mentioned above. An easy way to increase the intensity of your run is to increase your speed. The faster you run, the more calories you burn. To give you an idea how this can work out: a person weighing about 150 pounds may run at 6 miles/hour for 30 minutes and burn 342 calories but increasing this to a speed of 8 miles/hour, the calories burned are 458. Other simple ways to enhance your workout include having the best running shoes, consulting a doctor and doing proper pre and post workouts. Aside from using running as a means to lose weight, many people wonder if running can help you become taller. The answer is it can only if you run in a way that promotes production of the growth hormone. Running also makes you appear taller by giving you a streamlined appearance, proper body form, and increased bone length, factors which when combined make you appear taller. There is no fixed answer to the question how long does it take to lose weight running. A number of factors are at play including your weight, calorie intake, workout intensity, duration, speed and more. An easy rule to flow is to keep a daily calorie deficit of 3500 in order to lose a pound. This may not seem like much but it is the only way to ensure safe and lasting weight loss.